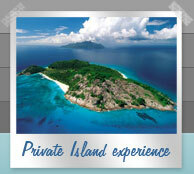 Guided diving safaris at the luxurious North Island. All meals, drinks and diving inclusive of stay. 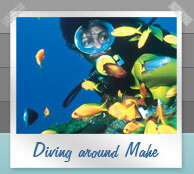 Island hopping and diving package based on accommodation on the main island of Mahe. Learn to scuba dive in the warm, rich waters of the Seychelles and explore what you've been missing! Learn to scuba dive and escape to a peaceful place to renew your energy and excite your senses. Diving in Seychelles When you experience the crystal-clear and warm water of the Indian Ocean, its colorful underwater world, amazing variety of fish and spectacular dive sites with their onshore powder-soft sands, it all makes sense instantly. Visiting Seychelles without getting a glimpse of the seaworld means missing the best part of it - after all, the Seychelles are internationally acclaimed amongst top diving destinations in the world. From whale sharks to eagle rays, moray eels to green sea turtles; you can have close encounters with the most magnificent marine creatures. On shore, divers are treated to world-class accommodations and breathtaking island scenery, completing an all-round 5 star experience. Into Seychelles offer you the choice of a private island diving experience where your diving, accommodation, meals, wine and beverages are fully covered for a first rate luxury experience or for those seeking something simpler and more focused toward the diving experience, our choice of dive packages on the main island of Mahe are a perfect fit. We offer the world's most popular dive courses developed by PADI, Professional Association of Diving Instructors. 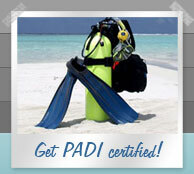 For first time divers we offer our PADI affiliated introductory dive courses. Select your preference from a quick & easy 2-day Scuba diving course or take the complete Open-Water certification and gain international diving freedom in just 4 to 5 days. Pro or novice - we'll cater a diving experience for you. What we can offer you: Into Seychelles (USA) offer international flight reservations, 5 star accommodations, superior service and excellent dive opportunities with our PADI partner 5-star Gold Palm Resort dive center located on Mahe Island in Seychelles. A dive center of this caliber focuses on memorable dive experiences, customer satisfaction, diver safety and environmental awareness, by going the extra mile to provide professional and outstanding service - from beginning scuba programs to wreck diving and shark dives. You are in expert hands from both travel and dive arrangement perspectives. 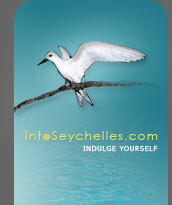 SUBIOS, Seychelles' annual underwater film and image festival wil be held on Mahe from October 04 to 10th, 2010. Ardent divers should visit this exciting national festival for the annual underwater photo and video screenings and internationally -acclaimed guest speakers.